Provides dependable detection of wall studs. Magnet works by locating steel nails and screws used to hold drywall to studs. Base of the stud finder is notched for convenient marking once studs are located. Master Magnetics Magnet Stud Finder, Red, For Do-It-Yourselfer or Home Improvement Customer Pocket-size stud sensor detects wood/metal studs up to a 3/4" depth. Easy visual indicators on face of stud sensor for easy readability; LED display and buzzer indicates stud edge. Small and compact, easily fits in pocket; uses powerful rare earth magnets to pinpoint the exact location of screws or nails in a stud and allows hands free use; 2 way level for ease of marking; soft grip for easy grabbing and gentle touch, no batteries required. Locates the wood or metal studs up to 3/4" deep. Red LEDs light up every time a stud edge is approached. An audio alert and green LED signals when the stud edge is reached. Should scanning begin over a stud, over-the-stud indicator alerts the user to start the scan in a new location. "TruCal" technology calibrates to any wall's density and a steady green LED "TruCal" light alerts the user when the tool is calibrated and ready to scan. Locates wood and metal studs up to 3/4" behind drywall. The "SpotLite Pointing System" shines a beam of light on the wall to identify the target. Red LEDs light up every time a stud edge is approached. SpotLite Pointing System, an audio alert, and a green LED signals when the stud edge is reached. Should scanning begin over a stud, the over-the-stud indicator alerts the user to start the scan in a new location. TruCal technology calibrates to any wall's density and a steady green LED TruCal light alerts the user. Wood and metal stud detection through up to 3/4" deep surface material; AC detection identifies live wires up to 2" deep; sequential LEDs and audible beeps indicate reading; marking channel with LED identifies target and makes marking surfaces easy and accurate; new ergonomic design and soft grip buttons provide comfort and control of the tool. 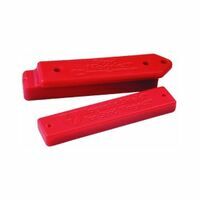 Locates wood or metal studs up to 1-1/2" deep. Red LEDs light up every time a stud edge is approached. The SpotLite Pointing System, an audio alert, and a green LED signals when the stud edge is reached. Should scanning begin over the over-the-stud indicator alerts the user to start the scan in a new location. "TruCal" technology calibrates to any wall's density and a steady green LED "TruCal" light alerts the user when the tool is calibrated and ready to scan. Wood and metal stud detection through up to 1-1/2" deep surface material; AC detention identifies live wires up to 2" deep; sequential LEDs and audible beeps indicates reading; marking channel with LED identifies target and makes marking surfaces easy and accurate; ergonomic design and soft grip buttons provide comfort and control of the tool. Detects wood studs up to 3/4" thick. Sensor lights and beeps when stud is detected. Powered by 2 AA Alkaline batteries [included]. Locates the edges of wood and metal studs and joists behind walls, floors, and ceilings up to a depth of 1-1/2". The SpotLite Pointing System shines a beam of light on the wall to identify the target, and WireWarning detection indicates live AC voltage. TruCal technology calibrates to any wall's density and a steady green LED light alerts the user when the tool is calibrated and ready to scan. The tough, ergonomic housing withstands everyday jobsite use. Locates wood, metal studs and joists behind walls, floors, and ceilings. The SpotLite Pointing System shines a beam of light on the wall to identify the target, and WireWarning detection indicates live AC voltage. Tough, ergonomic housing withstands everyday jobsite use. TruCal technology calibrates to any wall's density. Includes 9" Torpedo level. Zircon Stud Finder, 4 Mode, Multi-Function, Series: MultiScanner i520, Onestep, 1-1/2 in, Ultra Bright, 9 V Battery, For Detecting Wood and Metal Studs With Wire Warning Detection and AC Scan Digital multi-scanner provides detection of multiple materials, including wood, metal and live wiring. Ideal tool for construction, electricians, contractors, carpenters, masons, plumbers and others who need reliable detection. Provides versatility and consistent performance.